Hey guys and welcome to our liveblog of today's Google event, hosted by Android and Chrome head Sundar Pichai. We are looking forward to this event because we will expect to see the refreshed Nexus 7 make its debut and while it may be considered only an incremental update of sorts, its form factor, rumored price point and the fact that it is a Nexus device make it very desirable. The new Nexus 7’s most notable features might be the bump in screen resolution from 1280x800 to 1920x1200, bringing full HD to the mix. Also added to the hardware is a 5MP camera. There will still be a quad-core processor running the show, but instead of the NVIDIA Tegra CPU it will be a Qualcomm Snapdragon S4 Pro and there will be 2GB of RAM. The new tablet will also be a little thinner than the current model, perhaps as thin as 7.5 to 8mm. That means that things inside are getting cozy, so a slightly smaller battery will be on board, 3,950mAh versus the first generation 4,325mAh unit. 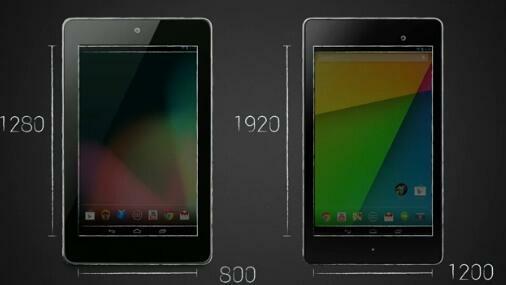 That also means the new Nexus 7 should be a little lighter. With that bump in specs comes a bump in price, so expect a new 16GB model to retail for $229 and a 32GB Nexus 7 to run $269. That pricing most certainly reflects Wi-Fi only models, though LTE support is expected to be an option as well. If you saw the press renderings of the new tablet, that little card-tray on the side is not a microSD card slot. With this new hardware, we are also expecting a new version of Android to be announced, Android 4.3 seem somewhat incremental from Android 4.2, but there are some significant improvements which we hope to showcase on the Nexus 7. The camera interface is expected to be enhanced and easier to navigate. Most notably though we should see the fruits of Google’s Project Roadrunner take root which means that we can expect much longer battery life. There are also changes to the on-screen keyboard. All these musings will find clarity soon enough, keep your browser pointed at PhoneArena.com as we will liveblog the event as it unfolds. We will be sure to get some solid hands-on time too. Sundar’s presentation is scheduled to begin at 9:00am PT | 11:00am CT | 12:00 Noon ET | 5:00pm GMT! 12:12 Well, it seems that's a wrap for today guys, but be sure to stay with PhoneArena, as more Nexus 7 coverage is coming up! 12:10 Other countries will be getting the device a bit later. 12:10 Google is happy to announce that Chromecast will retail for $35. Nice! It'll be available today in the US. 12:08 The so called Google Cast SDK will be available today as a developer preview for developers. 12:07 Mario from Google is back on stage to thank the various product teams in Google who've helped make the Chromecast a reality. 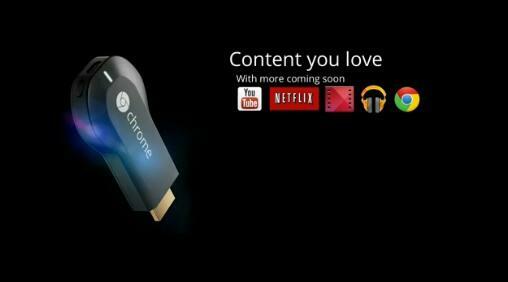 12:04 What's more, users will also be able to stream content to the Chromecast from a laptop and the desktop Chrome browser. 12:02 The Chromecast will also work for music playback. 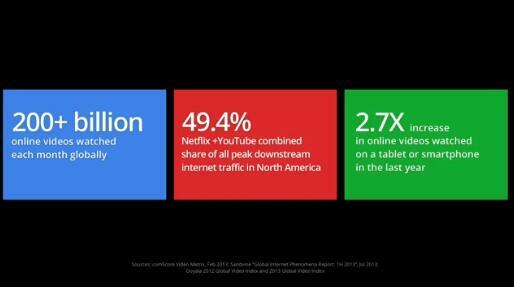 12:01 Control of what's playing on the TV via the Chromecast can be shared between different devices (even cross platform). 11:59 Third party apps, like Netflix, can also support the Chromecast. 11:58 The Chromecast will also flawlessly work with iOS device in the exactly same, seamless way. 11:54 Chromecast is automatically turning the TV on. Additional controls like volume, pause and so on are also working. 11:54 Google's apps will get updates to support Chromecast. For example, the YouTube app will have a new Chromecast button to start streaming. 11:51 Basically, Chromecast is like a bridge between your Android device and TV. 11:51 It's running a simplified version of Chrome OS. You can plug it into any HD TV and start enjoying your online content. 11:50 "The easiest way to bring your favorite online entertainment to your TV." 11:50 Today Google is announcing a new device - Chromecast. 11:47 Sundar is back on stage to talk about... online videos. 11:45 The new Nexus 7 will become available on July 30. 11:44 The prices will be $229, $269, $349, respectively. 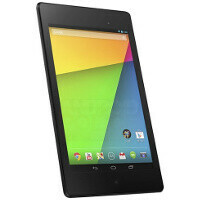 11:44 The new Nexus 7 will be available in three models: 16GB Wi-Fi, 32GB Wi-Fi and 32GB Wi-Fi + 4G. 11:42 Textbooks will be available on Google Play soon. 11:40 August 8 is when Asphalt 8 is going to launch for Android. 11:40 Prince of Persia: The Shadow and the Flame will be available on Google Play tomorrow. 11:37 The Google Play Games app will be available today. 11:37 "The new Google Play Games app lets you use Google+ circles to connect with your friends online." 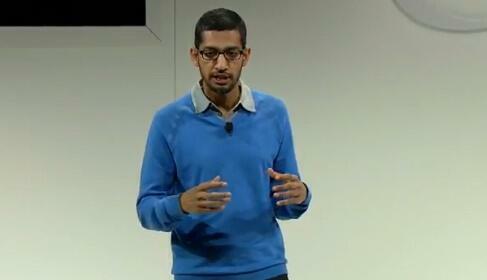 11:36 A new app, called Google Play Games will try to enrich gamers' experience on Android. It's a social thing. 11:35 It looks like a lot of major apps have been updated to support the new Nexus 7's outstanding resolution. 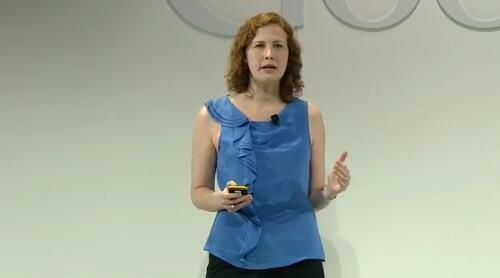 11:34 Google Play product manager, Ellie Powers is on stage to talk up Google's app store. 11:30 Mobile Chrome is getting a new version that will take advantage of the Nexus 7's new 1080p+ resolution. 11:29 Nexus 10 as well! 11:29 A new version of Netflix will let you play Full HD videos. Starting today, Nexus 7, Nexus 4 and Galaxy Nexus are getting Android 4.3. 11:26 They are showing us demos of 3D real-time apps showcasing the new OpenGL ES 3.0. 11:25 Android 4.3 adds support OpenGL ES 3.0. 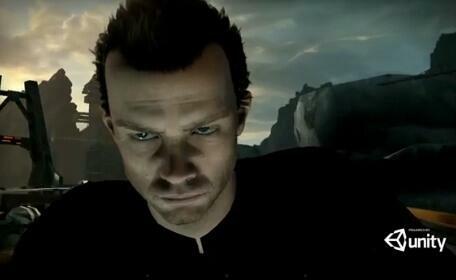 We can imagine game developers will be glad to take advantage of that. 11:23 You can give restricted users access to specifically chosen apps, as well as disable in-app purchases. 11:21 Android 4.3 will have support for restricted-access user accounts. 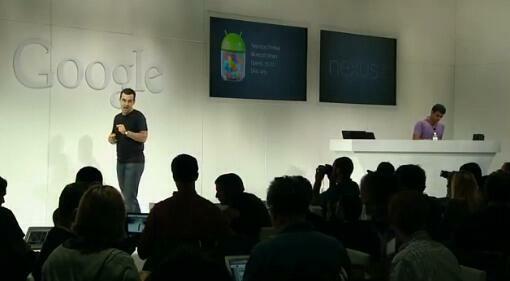 11:20 "The new Nexus 7 is the first device shipping with Android 4.3." 11:20 A 4G LTE model is going to be available; good news is it'll be usable with carriers in the US. 11:19 The chipset will be the oldie but goodie Snapdragon S4 Pro, clocked at 1.5 GHz. 2GB of RAM are going to complement that. 11:19 5MP camera is now found on the back of the device. 11:18 Stereo speakers and virtual surround sound are also part of the deal. 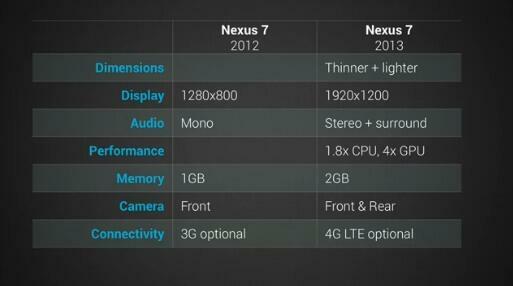 11:17 The new Nexus 7 will have a resolution of 1200 x 1920 pixels - best ppi on a tablet. Right now, the breakfast is the most exciting. The breakfast isn't "grand"? It has bacon. Any breakfast with bacon is grand....unless they're limiting your bacon to only one slice. If that's the case, its torture! You can never only have 1 piece of bacon! The bagel with lox and cream cheese looks good. I'd really love a little key lime pie for breakfast, however. Start already, Sundar is STARVING!!!! Let them eat mate. It's a breakfast with Sundar. Google gave an official release date for 4.3? $35???!!!! i just order this now.